Hokkaido is the island, located in the most north of Japan. Covering 22% of the total area of Japan, the island has a full of nature beauties in each four seasons which attracts many visitors. The local food culture varies with regeons in the island. Please enjoy the various local food. This is the main business and shopping district in Hokkaido. You can enjoy shopping, strolling the city and sightseeing. At O-dori Park, there is the Snow Festival in winter and huge snow sculptures and beautiful ice sculptures are magnificent. 1 minute walk from Sapporo station. 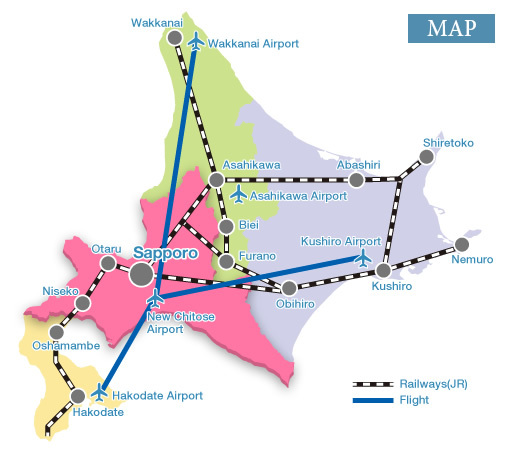 Directly connected to Sapproo station through underground passage. It's stylish & modern. Open-air bath on the top floor. 2 minutes walk from Sapporo station north gate. Easy access to Odori street through underground passage. Located in Sapporo city. 1 min walk from subway Susukino station on Nanboku line/10 min by free shuttle bus from JR Sapporo station North exit. 4 minutes walk from Sapporo station. Popular for the public bath in the garden. 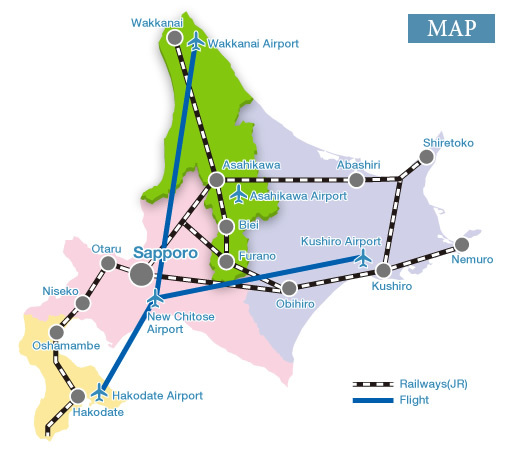 The area has an easy access to Sapporo City and New Chitose Airport. There are many sightseeing spots, such as Otaru the town of exotic atmosphere, Niseko the town of resort and Noboribetsu the town of the hot spring and nature. All rooms with lake view. See the panoramic view of Lake Toya from the open-air bath! Free pick-up service from Sapporo. A long-established Noboribetsu hot-spring ryokan. Your room with open-air bath. Try the largest open-air bath in Japan and the 4 kinds of spring quality. Pay pick-up service from Sapporo. Hot-spring hotel at Lake Shikotsu. Famous for the natural open-air bath unified the lake. Precious hotel for its folk art style in Hokkaido. It's good serving: Omotenashi. This is the northern most area, known as the town of summer resort. There are distinctive features of nature in this area, such as Cape Soya the northern most point, Furano the town of lavender field, Daisetsuzan National Park the largest national park in Japan, and Asahiyama Zoo the very popular zoo. It's a exciting resort. Enjoy natural hot-apring: Shisainoyu, Artistic area Ningle Terrace. Stands on the hill of Sounkyo hot-spring. The large public bath and open-air bath with the water comes directly from the hot-spring source. Famous for the largest open-air bath in Sounkyo. Free pick-up serivce from Asahikawa. Airport shuttle stop just in front. Hub of a day trip to Furano & Biei. Enjoy the Hokkaido Heritage moor hot-spring public bath. This area still remains the primival nature and ecosystem. Kushiro-shitsugen National Park is the largest marshland in Japan. Shiretoko the World Heritage, and Abashiri the town of floating ice are the famous features in this area. It is highly recommended for nature lovers. Located at Lake Abashiri. Enjoy good cuisine and hot-spring with water flowing directly from the hot-spring source. Featuring the large main bath, overlooking the lake. 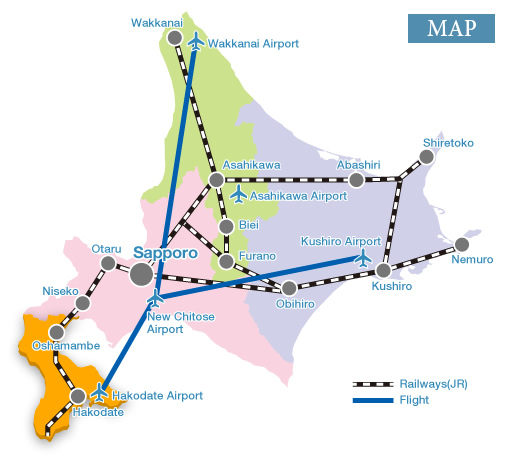 Regular bus is recommended from Memanbetsu Airport/Abashiri station. Renovated in 2015 by the Akan river! All the guest rooms are equipped with a bath with natural hot spring. Utoro hot-spring is the gateway of the world natural heritage; Shiretoko. See the great view of sunset from the open-air bath. Utoro hot-spring is the gateway of the world natural heritage; Shiretoko. Enjoy the panoramic view of the sea of Okhotsk from the large publuc bath. 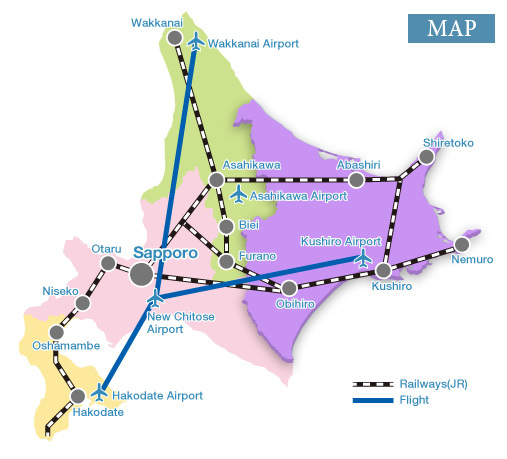 60 mins from Kushiro airport by shuttle bus. 10mins walk from Kushiro station. Easy access! This area features not only the nature but also the history and culture. Hakodate is the town, once flourished as the international trade port. There are lots of tourists attractive sites as Trappist Monastery, Goryokaku (star-shaped fort), Onuma Quasi-national Park and more. Ocean panorama in front of you! The best hot-spring with an ample supply of water in Yunokawa. 1 min walk from JR Hakodate station. Hakodate morning market just aside. 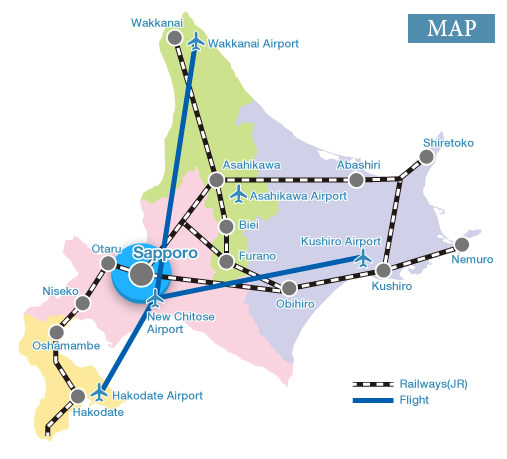 20 minutes by bus from Hakodate Airport, 3 minutes walk from JR Hakodate station. Squid Sashimi, the Hakodate specialty, at our breakfast is popular! Enjoy the great panorama of Tsugaru Channel from public large bath & open-air bath. Enjoy large-scale Japanese garden. Panoramic view of Tsugaru Channel from open-air bath in the sky.